This Christmas we did things a little differently and just loved it...for the most part. We invited a family friend and had a peaceful all about us and the Lord kind of Holiday. Yeah. What she get...what she get? What did ya get Aunt Pam???? Look at my pretty outfit! Check out all the bows in her hair! I think those and this lighted aquarium were her favorite! Isn't she pretty? Pretty evil I tell ya! Nah I shouldn't say that. Anyone living with Rett Syndrome can tell you that we call it..it being Rett Syndrome the invisible monster. We never know how or when it will tighten it's grasp on our children but when it does...all other life shuts down. As far as Rett Syndrome goes Abby is a pretty happy kid. I once even has a Neurologist tell me she was the least afflicted case he had ever seen. Now she is not the least afflicted case I have ever seen but more often than not Rett Syndrome is worse for other kiddos than my Abby. Most days, at first glance Abby appears to be normal. As long a she's quiet. Then you will notice the odd, rhythmic movement of her hands. Maybe another sideways glance and you see that this very tall 7 year old is drooling and licking her hands. By this time you are intrigued..you can't help yourself. She is so pretty...what could be (wrong) with her? She catches your eye and locks you there. It's like a Jedi mind trick. You can't look away. She then looks at you and dead serious says," Ah mag ackah likea boggah noo?" You find yourself looking away in shock then back at her. You might reposition yourself in the room/store/church. What is it? My God what has a hold of that beautiful little girl? Rett Syndrome. A horrible cage like monster that has control over everything she does. 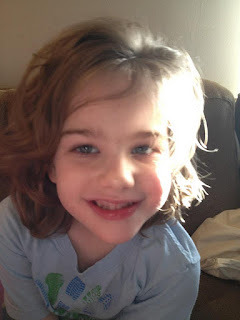 Rett Syndrome comes in stages.....Stages we don't like to talk about or even think about which one our girl is in. Not after stage 1 anyway. I think we may be entering another stage or phase in our Rett Syndrome journey. Abby is different...difficult..hard to deal with. She relies on me or others for everything. EVERYTHING. She cannot eat, drink, dress,clean herself or even pick up a simple...a simple...anything. She must be carried to her room and to the bath. She is getting quite heavy...Tiny girl that she is. I really don't know if she is becoming more aware of how trapped she is. If she is just down right pissed? I don't know if there is something hurting her. Maybe a little of all of the above? I know she stopped sleeping there for a little bit. Yes stopped. Easy thing to do with Rett Syndrome for some of the kids. Melatonin had been a God send for us for many years and it just stopped working. Her Neuro put her on a different med and hallelujah it's working. She had us cut it in half last night because it is an adult strength medicine and she was up to almost 1am. With the no sleep came these epsiodes or fits. I can no longer take Abby...almost anywhere. Not by myself and not without someone to help me. Even then it is usually too much for her. Unless I can hold her tight, give her my full attention and an ipod too with music or videos for her to concentrate on s.he freaks out. I mean FREAKS OUT. She screams in terror, claws at me. Bites. Her eyes always pleading for me to help her...get her out of there. Doesn't matter where it is. You get her back in the car or back home and she's fine. Happy as a clam in fact I don't know if this is a stage, or a phase or anxiety...I know it's at least anxiety I just don't know what to do to help her. So that is where we have been and what we have been doing. Trust me..it's exhausting. Christmas pics and a great surprise to fill you all in on soon.